In the beauty salon, and elsewhere in the Jordanian capital Amman, the 39-year-old mother of five, who is nicknamed “Little Saddam’ because her temperament so closely resembles that of her father, is much-feared. Especially if her upper lip is not waxed just right. Knowing the enemy, and a World Exclusive: Saddam Hussein’s Last Interview. Nancy’s going to have a heck of a time Draining the swamp. Too bad I sing like a frog or I’d audition for her understudy. Love the Spanish subtitles, too. The last Christmas card of the year, from Maria. In case you’re wondering, I don’t do year-end predictions, and I never make New Year’s resolutions. Have a wonderful New Year’s eve. As the NYT won’t listen to my very assertive requests to cancel my subscription, I browsed through the contents of this morning’s edition and found their annual Sunday Magazine obituary issue, quaintly named “The Lives They Lived”. I bet you $5 they don’t mention Jeane Kirkpatrick. The Husband might have been half-asleep but is very familiar with the NYT editorial criteria. He declined to wager. Darn. Sure enough, no Jeane Kirkpatrick. Instead, they had Anais Nin’s “other husband”, and the Naked Guy. Can’t say I had heard of those two before. America still remains the one revolutionary society in the contemporary world. 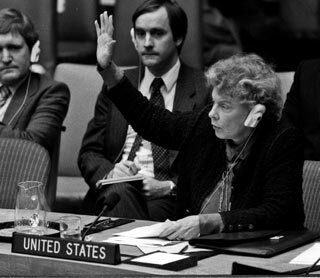 Thank you, Ambassador Kirkpatrick. The manly virtues include character, confidence, honor, inner strength, pride, responsibility, loyalty, generosity, industry and dignity. The antidote to the trans confusion, male girlfriends, and weepie guys? The Discovery Channel Guys, of course! Not one wuss in the lot – and Bear Grylls looks great without a shirt on. A top Iraqi official said Saddam will be executed before 10 p.m. EST Friday. Arab Muslims are voting and holding their governments accountable; al-Jazeera and al-Arabiya have broadcast this around the regions… This is very powerful and very important. The trial sends a message to almost every ruler who identifies with Saddam. The only thing that never happened is the governments to be held accountable – until now. The trial’s being aired by al-Jazeera and al-Arabiya. Senor spent half a day with one of Saddam’s attorneys and was told that other area rulers are terrified, and particularly mentioned Al-Assad. One dramatic development in the trial in recent days was Saddam’s admission that he was responsible for the 1981 assassination of a small Sunni town where 150 people killed and the town was razed. It is important for Iraq to close this 3-decade chapter [in its history]. Let’s not underestimate the power the image of Saddam’s execution will carry across the Middle East. Iraq The Model has the latest. Update, Saturday December 30 While CNN spouts off how Saddam – whose own official documents suggest that a staggering 5 million executions were made during Baath era alone – was a”champion of the Arab cause”, Gateway Pundit points out that Saddam was hanged inside one of his former torture centres. As I said above, area rulers are watching. The Anchoress, who’s a much better woman than I, grapples with the issues of morality. Me, I’m glad the SOB’s dead. So is Pamela. And now for The Very Briefest of Neocon Retrospectives. More from Claudia Rosett. Another update: Again, we can be proud that the United States of America brought him down. And that no dictator can ever feel entirely safe again. Later update, Sigmund, Carl and Alfred and Dr Sanity examine the reaction from the Left. When he’s not using taxpayer money to pay for high-ticket lawyers to defend him from bloggers, Red Ken’s always looking for a good time. What better, then, than to pull out all the stops in 2009 to celebrate 50 years of communist paradise in Cuba? The event, to be staged in 2009, will involve street parties, sports venues and some of London’s leading museums as well as the closure of Trafalgar Square. Although the Mayor’s office refused to provide budget estimates, it could cost up to £2 million. 2. Ken’s idea of “justice” is, in a word, perverse. However, since the celebration won’t take place for another 2 years, here’s to hoping that by then Cuba will enjoy a free society. Now, that would be cause to celebrate: I love Trafalgar Square – I might even join in. Like many millions of other immigrants, New Yorker Herman Badillo is living the American Dream. His new book, “One Nation, One Standard,” is a call to arms for Hispanics who are being shut out of that dream. So why are some of Mr. Badillo’s fellow Hispanic Americans now calling him a race traitor and bashing his book even before it was published yesterday? first consider the credentials Mr. Badillo brings to his subject. He arrived in the U.S. as an 11-year-old orphan in 1941 and by 1970 was elected the first Puerto Rican-born U.S. congressman. Mr. Badillo has since been deputy mayor of New York under Ed Koch, run for mayor himself and was former Mayor Rudy Giuliani’s counsel on education, eventually leading efforts to reform and restore to excellence the City University of New York system. Out of this experience comes Mr. Badillo’s blueprint for immigrant success in America. The main focus of “One Nation, One Standard” is the Hispanic community, and his central theme is education, without which, he emphasizes, no amount of work or other opportunity will help a person rise. What’s got his critics in a tizzy is Mr. Badillo’s assertion that Hispanic parents cannot depend on the government to educate their children. As a parent, I would insist that no parent can depend on the government to educate their child. In a true sense, education implies a formation on moral, intellectual and social values that transcends the classroom, and which can not be provided by a school. In the case of immigrants, as I blogged about last year, prior generations of immigrants were directed towards what it meant to live in an American culture by school and other social institutions, and now schools purposely avoid doing that for the sake of multiculturalism. Instead, he says, they must push their kids and rise up against a system that steers Hispanic and other minority children into segregated classrooms of designated underachievers. As the results in California have shown with Hispanic children, it delays assimilation by perhaps a full generation. Those in “English immersion” have more than twice the rate of English proficiency of those in the “bilingual” system (being taught other subjects in Spanish while being gradually taught English). However, school administrators who get funding for bilingual programs will place the children in those programs because it justifies their jobs and it generates funding. By doing so, they deny these children the means to success not only in our country but across the world. The critics have focused on a few phrases in the book noting that the Hispanic immigrant community has not always placed as high a value on education as, for instance, Asians have. This is not an insult and does not sound like one when you actually read his book. It is not an insult – it is the truth. As Mr. Badillo explains, the Hispanic cultural experience was formed in part by centuries of Spanish colonialism and the feudalism it spawned in Latin America, followed by decades of dictatorships and strongmen. This cruel legacy has imbued many people with a subconscious notion that stations in life don’t change, and a sense that help can only come through the luck of having a benevolent leader. “One Nation, One Standard” calls on Hispanic Americans to throw off those mental shackles and claim the rights and opportunities that other citizens enjoy. His goal, he told us in an interview this week, is to sound an alarm that what is now the country’s major immigrant group is at risk of becoming the first such group not to follow the path of each generation doing better than the last. After I left liberalism I’ve disagreed with many of Badillo’s politics, and I’m glad to see that he refers to himself as an ex-liberal. He’s right on the mark when it comes to education. The book is called One Nation, One Standard: An Ex-Liberal on How Hispanics Can Succeed Just Like Other Immigrant Groups, and I’ll be reading it. The problem is regional. Most countries in Latin America, with the relative exceptions of Brazil and Chile, continue to be focused on commodities and some basic products derived from them. Asia has been going the other way, looking for the growth needed to improve the life of their populations, China, India, Korea, Malaysia and other countries in the region have bent over to attract foreign investment and create friendly atmospheres for them. Some like India had excellent educational systems in place. Others decided to invest not only in education, but in high quality education at all levels and staring from the bottom. Venezuela News and Views looks at The new Venezuela: Chavez or else and how the cult of uniformity kills natural joy. I once felt that my dignity was being trampled upon. I once believed that by exposing the vices and double discourse of chavismo I was doing my bit for my country. No more. Most of my countrymen, on both sides of the divide, think otherwise and behave accordingly. Chavismo is but a manifestation of Venezolanismo and its time has come. The country has changed for good, those who were in the back of the list are now in power and with a fresh mandate. Whatever comes after depends on them, in the meanwhile many folks around are having the time of their lives. To make a proper analysis of the political scene at the start of 2007, let’s first dispel the myth that Latin Americans rushed to embrace Marxist revolution at the polls in 2006. There were hard-left “victories” in Venezuela and Bolivia but neither of those elections qualify as democratic. The Venezuelan contest was riddled with irregularities, including and unaudited voter registry, and Chavez-controlled judiciary and electoral council, and the incumbent’s use of state oil revenues in the campaign. It is impossible to divine voter preferences in that race. But there’s another reason, too, I think, that Latin America cannot seem to get out of the spin cycle of populism. And that is the intellectual impoverishment the region suffered in the second half of the 20th century, when the state got control of academia and the liberal debate about what constitutes a free society was silenced. The observation of Venezuelan-born journalist Carlos Ball in this column on Jan. 5, 2001 – that after 40 years of far-left control of “the schools, the univerisities and arts” in Venezuela “the general public [had] fallen under a well-organized system of leftist indoctrination” – applies to the vast majority of Latin nations. And it also could in the long run apply to the USA, as many institutions are grappling with that problem. Defeating chavismo is as much about refuting an ideology that rejects individual liberty as it is about containing a military threat. This requires a challenge to the populist paradigm that now pervades Latin political thought. It is an achievable goal but one that, as Mr. Ayau can attest after years of hard work, won’t come easy. Until we get such an intellectual breakthrough, expect persistent instability and lots of Latin emigrants, with or without Chavez. It doesn’t take a psychic to forecast that 2007 will bring more of the same. Michael Totten’s back in Lebanon, and has a terrific report on Hezbollah’s Putsch – Day One, with his own photos. As always, Michael does exceptionally good blogging and you must read the entire post. One thing is clear, Michael loves Lebanon and its people. Mary joined Michael in Beirut, and she also has pictures. Judith went to Israel and later met with Mary. Three fascinating reports by three bloggers I’ve had the honor of meeting, and who I greatly admire. what is it about this vast collection of pensions, and time servers, and tenured editorialists, and beat reporters covering car crashes, that makes it better than the blogosphere? JR: I’m sorry, I’m not following the question. HH: What is journalism, in your eye, that blogosphere isn’t? What’s so great about the mainstream media? While Joe, who graduated college less than 2 years ago and is twenty-three years old (I have a pair of Ferragamos that are older than him), was clearly outclassed in every way, what I want to know is, why did the WSJ publish his ridiculous article on its op-ed page? This wet-behind-the-ears kid hasn’t even bothered to read the WSJ’s own Best of the Web, which showcases exactly that: the best of the web. Maybe the WSJ wanted the bloggers to blog about it? Update: An exploration of the blogosphere by someone much more knowledgeable and experienced, The Blogosphere at War, and the information warriors.